I chose to do my video on DACA, also known as The Deferred Action for Childhood Arrivals. This topic caught my attention and is one that I’ve been keeping up with for a while since it is one that is talked about a lot in today’s word. I also feel that hearing the struggles of all these kids trying to get an education but being prevented from not only going to school but also working and living with their families really breaks my heart. 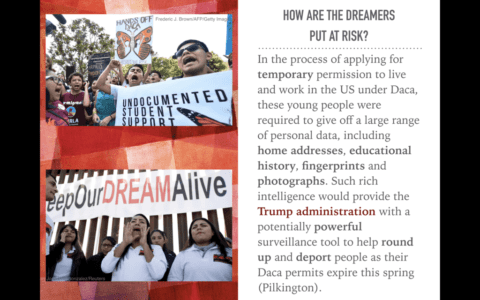 The constant fear that they have to live in since in the process of applying for DACA they give off a large range of their personal information, is one that no one should not have to worry about. I knew a lot about this topic because DACA and the story of these people have always been something that both my parents and I follow and support. Now after this project I’ve learned a couple of new things. I’ve learned more about the DACA recipients and what countries they come from and how many people have applied. I’ve also learned more about the requirements of applying to DACA such as age and how long the person has had to live in the United States for in order to be eligible. Defending DACA by Melanie is licensed under a Creative Commons Attribution-ShareAlike 4.0 International License.